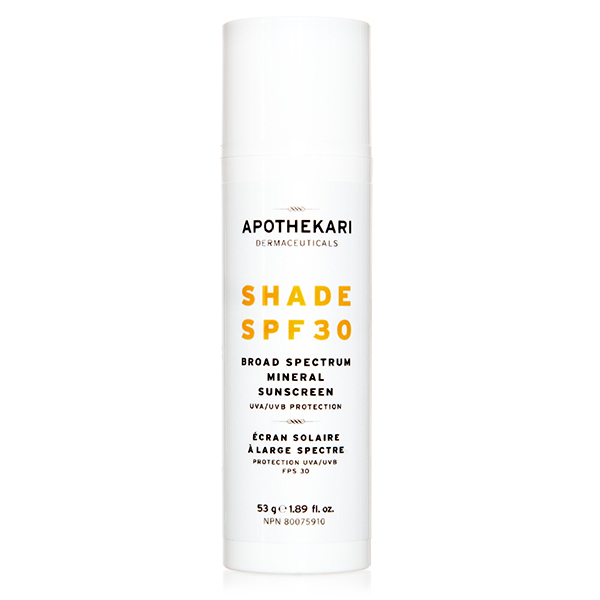 We are excited to offer you Apothekari Shade SPF 30, our natural, mineral, non-whitening sunscreen, which is ideal for all skin types! Formulated with 13.5% zinc oxide (ZinClear) to deliver broad spectrum UVA/UVB protection against sun exposure, it also offers healing, soothing and calming properties. Red algae extract (a UV absorbing substance) and ergothioneine (a natural antioxidant and amino acid, which prevents UV damage) offer additional UV protection and help support against free radical damage. Shade SPF 30 is non-whitening, designed for all skin types and is gluten free and vegan. It is an absolute must-have for anyone concerned about the health of their skin. Physical blocking sunscreens that contain ingredients like zinc oxide are the sunscreen of choice for individuals with sensitive skin and for individuals who have melasma because they work by deflecting UV rays before they reach the skin’s surface. Chemical sunscreens work by absorbing UV rays and converting them to harmless energy so they may not be as useful in the management of melasma. Zinc Oxide. Broad spectrum protection from UVA and UVB exposure which also promotes healing, soothes and calms the skin. Zinc oxide is photostable (doesn’t degrade upon exposure to UV light), protects against the full UV spectrum and is recommended by dermatologists for us in those who have sensitive skin or cannot tolerate chemical sunscreens. Directions: Apply to clean skin 15 minutes before sun exposure. For daily use, allow the product to absorb completely before applying make-up. Product should be “patted” on, not rubbed in. Reapply frequently.